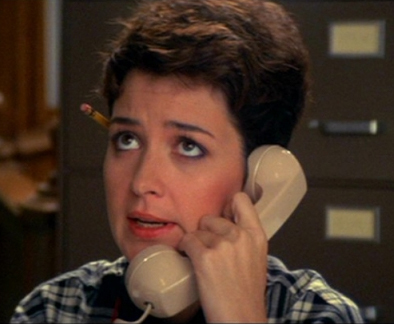 Anybody who has seen Ghostbusters remembers this line by Janine (Annie Potts,) the receptionist to the aforementioned spook seekers. It’s a funny line not only for the sarcastic delivery, but also because a receptionist would never answer a phone this way. At least, not if she wanted to keep her job. There are so many things wrong with her phone greeting from the tone to the bad pronunciation of “what do you want” which brings us to the point of this article. How do you answer a phone professionally? You would be surprised with how many people don’t correctly greet customers on the phone. Have you ever called a business and the worker spoke so quickly, you have no idea what they said? I always end up asking them to repeat and have to keep myself from telling them to SLOW DOWN. If your customer doesn’t understand you, then you are taking a chance they might just hang up. Or your business sounds like it is run by a teenager. Both of these are bad, so be sure to tell your phone greeters to slow down and make sure the entire greeting is understandable even if it takes up a few more seconds. Related to this problem is enunciation. In the example, Janine says the phrase “whattaya want.” Instead, she should have spoken clearly and said “what do you want.” (Ignore the fact that a receptionist should never answer the phone with this phrase.) Part of this is the character’s accent (New York City), but even with the accent, she could have enunciated. This is another example where the caller may not understand you and hang up. Lastly, it is important for the greeter to have a script to read from especially if you are a small business and everyone answers the phone. Most customers don’t like change and answering the phone with the same greeting each time can instill a sense of comfort and branding. Tell your employees to slow down, enunciate, and use a planned script and your greetings will be stellar. Don’t forget this also applies to voicemail. Your caller may need to write down the information you are telling them and listening to it over and over again just to understand the message is a waste of their time. This entry was posted in Voicemail and tagged voicemail by Kimm Antell. Bookmark the permalink.